Matching details of the home and family as well as their expectations of their proposed dog or puppy is a must. This information is compared with the characteristics of the dogs that the Trust has available. The homing process may take up to three weeks before the dog will be able to leave with it’s new owner. During this time, owners and their family will be expected to visit, spending time with the dog or puppy to form a bond. Every potential new home is carefully vetted by a team of volunteer home-checkers before being re-housed. The homing procedure is only complete when they are certain that there is a very good match. Before being homed, both puppies and dogs are vaccinated, micro-chipped and neutered. New owners take the dog on the understanding that if things don’t work out the dog must be returned to the Trust. Where they have no history of a dog, they will not normally re-home dogs to families with young children. Inevitably some dogs are with the Trust for a long time, some even for the rest of their natural lives. An absolute rule of the Trust is that no healthy dog is ever put to sleep. The bible of quality dog breeding, this guide is a must-have for novice and veteran breeders alike, covering everything from developing a viable breeding program based on pedigrees and genetics to whelping, raising, and socializing puppies. Now back in print with a new foreword by AKC Breeder of the Year Wendall Sammett, this book has long been the reference of choice for successful dog breeders. 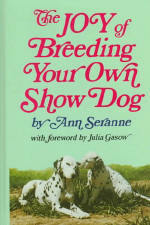 Ann Seranne cobred and/or owned sixty-two Yorkshire Terrier champions, six Standard Poodle champions, and two Shih Tzu champions. Explains the fundamentals of genetics, modern breeding systems, care of puppies and pregnant dogs, and how to evaluate young dogs according to breeding standards.